One of my favorite quotes from the movie, Steel Magnolias is when Julia Roberts’ character proclaims her wedding colors to be “blush and bashful,” to which her mother replies, “your colors are PINK and PINK.” At first blush, wine may seem like a red and white issue, but there’s a lot you can tell about a wine’s age and type by its nuanced hues. For a taste of the wine color spectrum, check out these wine-color-inspired, vineyard-friendly fashions. Whites tend to darken with age – younger wines may look yellowy green whereas older wines may give off the appearance of a yellowy brown color. Wines like Rieslings, Sauvignon Blanc, and Chardonnay can range in body type depending on how they are produced. Light-bodied white wines tend to be pale yellow, with high acidity and are best served ice cold. Medium-bodied white wines are light gold in color with medium acidity. Full-bodied white wines tend to be a deep golden color. These wines are rich with the least acidity. Reds like whites change color as they age. Younger reds tend to be purply-red whereas older reds are more of an orangey-red. Red wines also become more transparent over time. Light-bodied red wines tend to be transparent and acidic, with low tannins. Medium-bodied red wines are less transparent with medium acidity and tannin levels. Full-bodied red wines are opaque and have high tannin levels and low acidity. 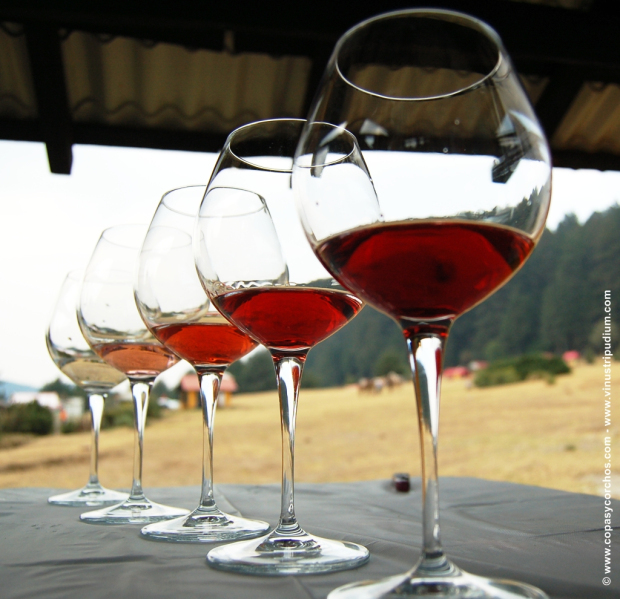 For wine tasting tips for the rest of your senses, check out this post.